Google has reported its highest quarterly profit, suggesting that the internet advertising market is bouncing back from the recession. 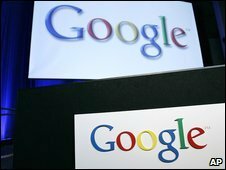 Google reported net profit of $1.64bn (£1bn) between July and September, up 27% on the same period a year ago. "The worst of the recession is clearly behind us," said Google chief executive Eric Schmidt. US computer giant IBM also reported strong profits of $3.2bn for the period, up 14% on a year earlier. The company also delivered a more optimistic forecast for full year earnings. Management said they too were seeing some stabilisation in the overall economic environment. Revenue at Google for the three-month period came in at $4.38bn, which was well ahead of analysts' expectations of $4.24bn. "Because of what we have seen, we now have the confidence to be optimistic about our future," said Mr Schmidt. The company also announced two new initiatives, including the sales of electronic books through a new electronic editions service. This would be in direct competition with Amazon and Apple. Google has also agreed a deal to broadcast programmes from the UK's Channel 4 on its YouTube site. "People think of online video when they think of YouTube, but now YouTube is trying to bring in movies and longer-form content, which will let [Google] bring in new advertising that is going to be very profitable for them," said respected technology blogger Robert Scoble. The internet search engine has weathered the recession better than other advertising-dependent companies, and it was widely expected to be one of the first beneficiaries of an economic recovery. "Google has no competition. Yahoo is withering on the vine and [Microsoft's] Bing is too tiny now," said Colin Gillis, senior analyst at Brigantine Advisors. "They did great on every single metric. We think this is sustainable." He said the message from the Google management was loud and clear: "Big brand advertisers are back and they are spending money." Google's shares rose $16.44, or 3.1%, to $546.35 in extended trading on Thursday.